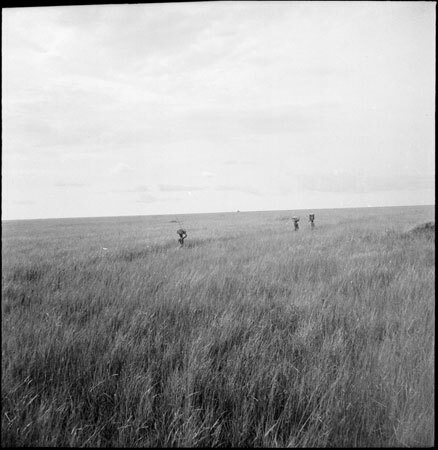 A distant image of three carriers in a treeless grass savannah in western Nuerland. Evans-Pritchard arrived at Adok in Dok country on October 1st 1936 having spent the preceeding months completing a survey of the Luo of Kenya. He soon moved on northwards however, spending most time among the Karlual section of the Leek tribe. Morton, Chris. "Nuer porters" Southern Sudan Project (in development). 03 Jan. 2006. Pitt Rivers Museum. <http://southernsudan.prm.ox.ac.uk/details/1998.355.67/>.